Decided to sauté up some shrimp tonight with garlic, ginger and a healthy dose of crushed red pepper. To satisfy my Paleo side I had some fresh, spiralized, crisply sautéed zucchini. To make my Italian restaurateur husband happy — pasta. Some roasted peppers, zucchini, baby eggplant and cherry tomatoes completed the meal. I think we were in heaven when we sat down to eat. My husband wanted some white wine. 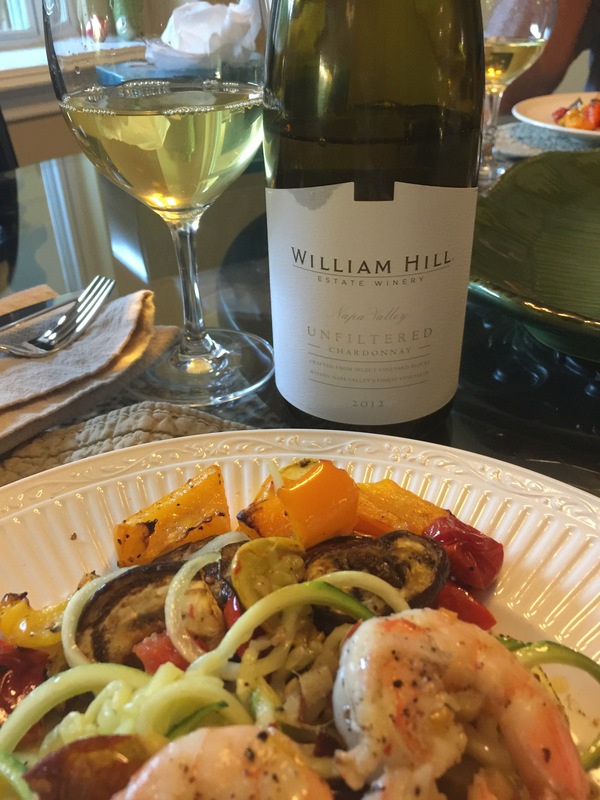 I knew I didn’t have enough Chateau St. Michelle Dry Riesling to share, so I opened the only other white I could find in the cooler–William Hill Unfiltered Chardonnay 2012. I really like this wine despite its oak regimen. It reminds me of summer grilling–flavors of grilled peaches and pineapple along with the fresh taste of ripe yellow apples. Don’t forget a dessert of flakey buttery pie crust, because that is all in the bottle, too. All darn good!! Looooooong finish. That yellow Apple just stays with you. Gotta love it. From a pairing standpoint, the Riesling stood up far better to the ginger and crushed red pepper. For dessert, the William Hill Unfiltered Chardonnay is, all by itself, a fine finish to the meal. And my husband did the dishes. All is good in the world.